When Bitcoin finally blows-up, what investments should I be in to avoid the fall out? Obviously, NOT Bitcoin or any other similar "currency". Good point. I was thinking about a wider contagion. Maybe you can't avoid the fallout. When things get big enough, they all become interconnected and correlation approaches 1.
what sort of spill over effects are you envisaging? Obviously you need to hold a short position. Like in 2008/9 the only real winners were those short the market. Good luck. Alternatively you can just stay the course. Nobody I know owns bitcoin. I bought some over the last 2 years. (less than $500) and sold it over the last 6 months. I don't think there will be tons of collateral damage from a potential bitcoin fall. I'm assuming it's coming...but when is another matter. BTW, my 15 year kid texted me this morning and said, "he dad can I buy some bitcoin?" So...there's that. You know it's bad with the teenagers are speculating. The bitcoin market cap isn't yet large enough to cause systemic problems. Come back when banks are holding large quantities. If your 15yr old has income (mowing lawns or whatever) would you let them invest in btc or individual stocks or other risky ventures? My kids are much younger and I wonder how/when to introduce them to investing. I'm close to a total bitcoin skeptic, but I think that it is a very bad mental habit to use language like "when bitcoin blows up." We don't know that it will. And even if it does, we don't know when, or how much more it will grow before it does. I realize that "when" is just shorthand, but if your left brain keeps saying "when" your right brain may start to believe it. 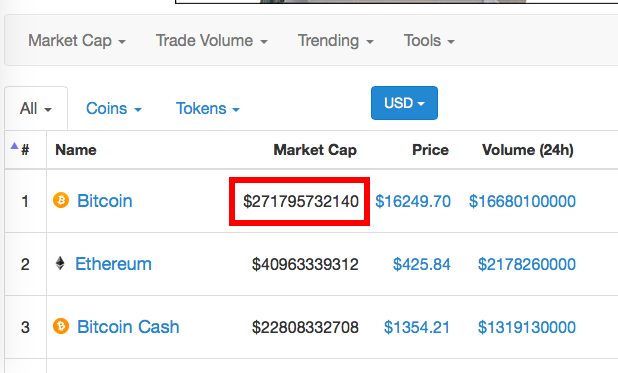 Bitcoin's total market cap is about $0.1 trillion. The world total market cap of all assets is something like $80 trillion. The U.S. stock market maybe $25 trillion these days, bond market $30 trillion. The current market cap of Apple alone is about $0.9 trillion, GE alone is something like $0.15 trillion. While it is impressive that bitcoin has reached figures in the same ballpark as megacap companies, it is still not as big as GE. I don't see why a hypothetical bitcoin collapse would produce any more of a systemic crisis than the real collapse of GE has caused. To protect yourself against a possible bitcoin collapse, just don't invest any important money in bitcoin. None would be a good amount. Last edited by nisiprius on Thu Dec 07, 2017 10:50 am, edited 2 times in total. Well, if I really knew for sure, I'd probably not be asking. But, I just don't know if and to what extent Bitcoin is being used in the financial markets. Like the last go around (2008?) where below prime mortgages were used as collateral - as best as I can recall. And then that snowballed. I'm sort of at a loss to see the relationships between Bitcoin and the greater financial markets. Given the institutional players getting involved in bitcoin now, I expect any blow up and wider contagion would be financial sector related. "Bitcoin Is an Emerging Systemic Risk"
"Fed Vice Chair: Cryptocurrencies Threaten Financial Stability"
In a broader sense, I expect that the best approach is to stay the course and invest in the entire market, trusting that the market works out the details. Always a good sign!!! Sort of like the old story about a shoe shine boy giving old Joe Kennedy stock tips before the crash - only more than slightly updated. Digital currencies may pose a threat to financial stability as they gain popularity, said U.S. Federal Reserve vice chairman for supervision Randal Quarles. Speaking at the 2017 Financial Stability and Fintech Conference on Thursday, Quarles warned against the rise of cryptocurrencies, saying private decentralized currencies could have "spillover effects" on the broader financial system if they grow too big. "...as they gain popularity" suggests he doesn't think their current degree of popularity is a problem... yet. I thought I read something about one of the stock exchanges beginning a trade like that in Bitcoins. Not that I'd ever be smart enough to trade in that market. With the volatility, I would assume you could go broke in that fairly quickly. Naked shorts in Bitcoins. Oh, joy. The biggest commonality here will be a liquidity crunch, so Japanese and American government bonds will be the best assets, based simply on th amount of debt out there. But the wrinkle here will be if Bitcoin gets significant amounts of real assets linked to it to cause an inflationary spiral when it goes from 11K to $500. That would make TIPS or t-bills the best choice instead of long treasuries. In terms of least exposed, my guess would be water, sewer, and toll road muni bonds from low-debt, low-pension obligation states like Nebraska, Florida and Tennessee. Also, re systematic risk, bitcoin futures are about to launch. Last edited by Theoretical on Thu Dec 07, 2017 11:01 am, edited 1 time in total. Sometimes the simplest solutions are the best. Thanks. I work at a Fortune 500 manufacturing company and everyone that shares my workspace has been buying bitcoin. It's all I hear about. The same investment you are currently in (hopefully it is anything but cryptocurrency!). If you are in your accumulation phase, stay accumulating by buying cheaper assets (assuming the blow up of bitcoin would negatively affect other assets). If you are in your retirement, then rebalance your portfolio. Staying the course is the only thing we can do to reduce risks that we can not control. I told him we would talk tonight. Currently he has a UTMA account with all his savings in the VTI etf. I've slowly started talking to my 15 and 12 year about investing. So far, we've discussed management fees and the negatives of firms like Edward Jones. At this point in life, sure, I'll let him invest part of his savings in bitcoin and teach him it's not an investment, but pure speculation. It would be a learning lesson if bitcoin did crash...and at the most, I would only let him invest $25 to $50. But, before we do that, I'll ask him to research what bitcoin exactly is and how the price of it is calculated. We all should never invest/speculate in something we truly don't know what makes it tick. Though I'm neither a Bitcoin skeptic nor a true believer (I don't have any invested in it, though I seriously considered buying some at $600 ), I think that the only intellectually honest position regarding Bitcoin, cryptocurrency in general, and the future at large is that we know nothing with certainty. Even in the presence of historical evidence, there are no guarantees of future performance as many are very quick to point out on this forum. When it comes to discussing factor investing or backtested portfolios, people are quick to say "Nobody knows nothing," but when it comes to Bitcoin, they act as though they know that the outcome will be disastrous, despite the market obviously disagreeing with them. This makes me really question how many here truly believe in the efficient market hypothesis; I for one do not, at least not the 'strong version'. Generally speaking, I think it's safe to say that Bogleheads are a fiscally conservative bunch and not early adopters of new technology. Bitcoin and cryptocurrency in general is a very new idea using very new technology and is not very easy to completely understand. Taken together, the rampant skepticism of Bitcoin on this forum is to be expected. As long as owners of Bitcoin have confidence in the currency, it will not 'fail'; if that confidence is lost, then the currency will fail. This is true of any currency out there and also true of the financial markets in general. If confidence is there, all is well. If that confidence is lost, the herds move for the exits very quickly. It's leverage that turns the fall in price in a financial asset into an economic effect. The other effect was that manufacturers of internet equipment and software had had all that debt and equity raised turned into orders. So that bubble in actual spending disappeared, with knock on effects. The economy was hit, and particularly places like London, NY, SF that had been the biggest beneficiaries of the bubble (Ottawa oddly - JSD Uniphase & Nortel were Ottawa companies). The deleveraging which took place amongst consumers & businesses in the US and other affected countries was brutal-- big impact on final demand for goods and services. And of course a downward spiral-- if your investments are going down and your neighbour is losing his or her job, you are not likely to spend more money. And then your state and local government cut back because the tax revenues are down. I would say cryptocurrencies are not even at the level of the dot com crash, let alone ancillary industries like Media & Telecoms. The actual stimulated demand for goods and services (such as mining hardware) by bitcoin and ilk is very small. And AFAIK there is not significant leverage. It's relatively hard (I believe) for most retail investors now to tap leverage to invest, and institutional investors are not present in bitcoin at all. I don't worry about a bubble bust at this level. Maybe if it is 10x the value then I start to worry that there's some leakage back into the financial system and the real economy that I cannot see. But if it drops say 90%, some people have "lost" some money-- paper profits that have gone away. Kind of like the price of gold or silver falling. I just don't see the leverage in this one. Nor the connection to the real economy (final demand for goods and services). I would suggest increasing the amount you let him speculate with to an amount that will really hurt if/when he loses it. The loss needs to hurt enough so that he'll clearly remember it 10 years from now when he's making good money and the next bubble comes along. If folks are buying bitcoin instead of stocks, doesn't that reduce the demand for stocks and cause the rise in the market to stall or fall? And if they're replacing bond or gold purchases, doesn't the continued frenzy in Bitcoin cause a similar competitive reduction in those asset classes? When Bitcoin blows up, some folks will wind up losing their shirts, while others who have cashed out will have cash to buy real assets. Might wind up being good for the market as a whole. So far we haven't run out of greater fools yet, but the supply of these fools with real cash is limited IMO. The Nvidia graphics cards are used a lot by bitcoin miners. I was at a large local computer store last week and they had a sign that said that there was a limit of three graphics cards per customer because of a nationwide shortage. There may be other companies that also sell hardware to that market. It would be interesting to know how much exposure different countries have to bitcoin. I would suspect that countries with chronic currency problems and exchange controls like Argentina would be hit harder than others. China closed their bitcoin exchanges a while back but I am not sure what the current status of bitcoin is there now. Bitcoin is blowing up today. If you didn't buy Bitcoin earlier, you would have avoided the fallout. If you did buy earlier, you're now rich. I prefer the fallout. This is an instance when a time machine would come in handy. Wow! $19K today! Better get in before it's too late. With $100k, I can buy 5+ bitcoins today and when I sell the at $100k each, I'll make nearly half a million dollars! Seriously, Uncle Sam is probably getting a windfall from all the folks cashing in on Bitcoin. Of course, the reverse will occur when it blows up and they're taking losses or TLH. The digital currency hit a high of $19,340 before falling more than 20 percent from that level to $15,198.63. Your greater point about comparative market caps is still valid. And I agree 100% with your first paragraph: my experience is that smart people habitually say "I don't know", just like polite people habitually say "please" and "thank you". I can't see any reason why it would matter to the world at large. I doubt old Uncle Sam knows anything about most of the people cashing in on bitcoin. Don't start to worry until financial institutions start trading bitcoin hacking swaps. Or if Enron comes back from the dead to start brokering energy contracts to the bitcoin miners. There's less privacy than you might think. The whole idea of the block chain is a permanent transaction record that's traceable. Combined with additional data, individuals and transactions can be tracked. Coinbase was ordered to supply the IRS with the identities of all users in the U.S. who conducted at least one bitcoin transaction equivalent to at least $20,000 between 2012 and 2015. Coinbase will be required to turn over the names, addresses, tax identification numbers, and account details on 14,355 account holders out of its nearly 6 million customers. Before 2015, the total bitcoin transactions was only a trickle. With Coinbase, $20k*14k accounts is only $280M+ in transactions (not profits). The average high transaction over $20k might be double or triple that, but that's only a guess, and if so, still less than $1B. A ballpark estimate of this Bitcoin exchange might be 10X growth the last 2-3 years, so we might be looking at $10B in transactions at this one exchange. And if this exchange is say 10% of the total, then annual world bitcoin transaction might be around $100B, so if Uncle Sam can squeeze out 1% in taxes out of all this activity, that's an extra $1B in revenue. And if Bitcoin is as successful as some believe, the tax aspect becomes very substantial. If there is a wider contagion caused by a dramatic drop in the value of Bitcoin it will be from the same cause of contagions in the past, leverage, people borrowing to buy Bitcoins and being unable to repay their loans. Since Bitcoin can't be used as collateral, I would expect damage to be from borrowing against Credit Cards, Title Loans and HELOCs. Then depending on how extensive the damage you would see a reduction in people's ability to spend. Think of what some people did in 1999 when their options in Internet companies made them paper millionaires but cratered before the company ever went public. When I was 17 I lost some money in the dot com crash. Not a bad way to learn about the risk of fad investments. In retrospect though it would have been better if my parents limited the amount I was allowed to invest this way to a certain percentage of my overall bank account. Still, no long term harm was done. I can't imagine it having widespread impact. It has very little reach into the economy except as a speculative trading platform. The runups are getting crazier and crazier. I'm sure if/when it crashes we are going to hear a lot of stories about people who pumped all their money into this and lost it all. It reminds me of stories you can find on the day trading forums where people dump all their money into a company as a sure thing (for example company is going to get a big contract with Apple) and then the company crashes and burns (when the Apple contract is cancelled). These threads are just unreal, from the pump up at the beginning (with extreme confidence in a high future) and ending in how could this happen my life is ruined. If you can't afford to lose all the money you have in these highly speculative investments then you shouldn't be in them. Don't cry a river if bitcoin crashes and burns and goes to zero. I doubt that when Bitcoin implodes it will have any meaningful impact on the broader market. I have done nothing, nor plan to do anything to adjust my portfolio for this event. Does anyone know where I can buy some tulip bulbs? Easily available in any garden section of most major box stores. Now if you want to buy tulips with bitcoin, that would be a challenge. Now if you want to buy tulips with bitcoin, that would be a challenge. Bitcoin price expansion certainly resembles bubbles we've seen in the past. But people on this site have gone from articulating arguments against bitcoin to opinions and speculation premised on certainty it's going to crash. How can you have a thread on what to invest given bitcoin will implode? This is ridiculous speculation in the opposite direction and frankly asking for trouble for your portfolio. I don't have time to bring up the growth of nasdaq during the dot com bubble. But in the initial stages, the nasdaq was growing 10% a month. It grew from 500 to 5000 over a 10 year period before crashing to approximately 1500. Imagine if it was year 2 of the tech bubble and you asked something like, what should I invest in knowing that nasdaq will crash? What if your rationale back then was "10% a month growth just makes no sense." Markets can stay irrational longer than you can stay solvent. It doesn't matter how well you know bitcoin will crash, short it now and you have just as much chance getting burned as you have making money. It doesn't matter that bitcoin has no inherent value. It doesn't matter that bitcoin at $10000 makes no sense to you. The same argument held true when bitcoin was $1000, and even $100. Today its at $16500. It doesn't matter how insane or irrational you think it is. If the market wants to be irrational, it will be irrational. End of story. A bubble could pop tomorrow or a decade from now. And our best empirical evidence shows you have no way of knowing. The situation as to whether a bitcoin crash can cause ripple contraction effects on other parts of the economy depend somewhat on whether a lot of the bitcoin buying has been financed and whether the "bitcoin millionaires" can pay their bitcoin acquisition debt if their bitcoin value goes south. I don't think anyone really knows how much debt your average Joe and your affluent Joe have generated chasing bitcoins. How high can it go? I think a lot especially if big banks and institutions get in on the game. (Should they be allowed to join the game?) But if that happens and what I think is the inevitable finally happens then there will be real damage done similar to the housing credit bubble. bitcoin derivatives anybody? Any big (too big to fail) business ready to sell insurance contracts on them? It sounds like a game of "pump and dump". That is, in fact, illegal. Those Forums presumably record everything and know the real identities of the posters. If the SEC ever comes calling, the data is there. We are in a world of nearly negative carry-- the cost of borrowing to invest can even be negative (in real terms, short term, if you can find cheap enough mortgage debt or some other way of low cost borrowing). That tends to lead to bubbles. China looks like the largest bubble in history, bar the US housing finance bubble that peaked in 2006 and blew up in 2008. Bitcoin itself is a rounding error on that. But if the total bitcoin market value is $300bn, it cannot be that large. I would guess less than 50%. This is a rounding error in economic terms. The US housing mortgage backed security market was on the order of $8 trillion when that bubble finally blew. $6 trillion of Agency mortgage bonds + $2 trillion of private label (roughly that size). In addition, you had Iceland, Ireland, Great Britain, Netherlands-- so you had this international dimension to the housing bubble as well. A 40% fall in US housing prices (and over 50% in Ireland and Iceland, quite bad in Netherlands) had very large impacts on the US and global economy, particularly when coupled with the collapse of various financial institutions (Northern Rock, RBS etc.) and the fall of Lehman Brothers. This is a fly on the skin of an elephant by contrast. Not even the value of one of the tech stocks in the top 10 in the world index.